During my spare time that last couple days I have been busy sewing together a scrap quilt for my living room. I used up the last of my favorite red ticking stripe fabric (so sad), a little red fabric for the binding and leftover red fleece for the backing. 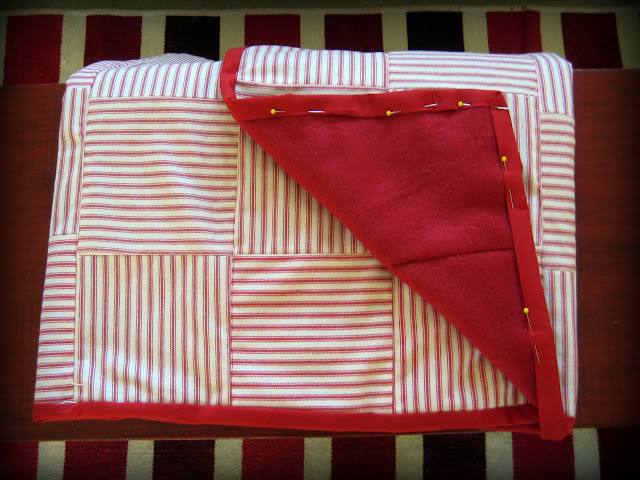 Using 6 inch squares, I sewed it together alternating the direction of the stripe. I didn’t worry too much about the squares not matching up - - it’s not worth my sanity! I added cozy fleece for the back and trimmed it all out with a 1 inch binding. You can see I still need to hand sew the binding onto the back. I'm waiting for movie night to roll around this weekend. See why I call it a scarp quilt? Two colors of red fleece on the back. Not very professional, I know, but I wanted to use up what I had. Besides, when I get sick of it I won't feel like I need to keep it since I didn't spend an arm and a leg on it. She'll look right at home when she'll all finished. This is super cute! I really love it,a nd I love the fabric! Robin, this is beautiful. That red ticking stripe is my favorite. Now you can cozy up on movie night. Have a good weekend. 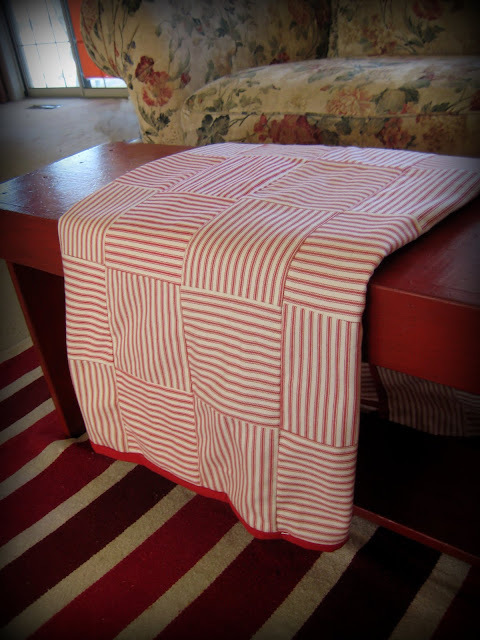 I love red ticking and you did such a good job on the quilt! Hope you and your sister enjoyed your day at Ikea!